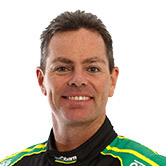 Milestone man Craig Lowndes says his 13th place in today’s second and final practice session for the Clipsal 500 was the result of the TeamVortex Holden Commodore VF simply not having the right set-up for the faster Dunlop soft tyres. “We ran out of time so we just had to put on a (soft) tyre and go for a run and see what it was like just to get an understanding,” explained Lowndes, who is contesting a record 251st championship round this weekend. “The car had too much understeer and we just pushed too much through the staircase. But it’s something we can work with. Two 10-minute qualifying sessions are conducted this afternoon at the Adelaide parklands circuit for tomorrow’s two 125km races, one conducted on soft tyres and one on hard tyres. 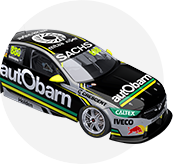 Lowndes is making the shift into the new Triple Eight satellite operation this year, which in practical terms at the race track means he moves into the garage next door to the Red Bull Holdens alongside the Tekno Autosports Commodore now being driven by Will Davison. Lowndes said one instruction from T8 was to remember to not drive into the Red Bull garage. “No we have spoken about that and I am pretty mindful of where we are and where we are positioned,” Lowndes told v8supercars.com. Lowndes also works with T8 technical director Ludo Lacroix this year, the Frenchman engineering V8 Supercar for the first time since 2006. “He is going alright,” laughed Lowndes. “He is very enthusiastic and when he becomes more enthusiastic he becomes more French. “He is a very clever man, we are just working with him and going through it step-by-step like we normally do. Meanwhile Lucas Dumbrell Motorsport is working against time to fix a misfire in Andre Heimgartner’s Commodore. Heimgartner says the team will get the SP Tools Commodore out in time for qualifying but can’t guarantee it will have fixed the problem by then. Scott McLaughlin led the second session ahead of Jamie Whincup and Shane van Gisbergen.